Hey my FAB peeps! School is out for the 2015-2016 school year!!! So far summer has been pretty FAB! What have I been up to? Netflix, naps, chill, pool, sleeping in, organizing, and so much more. As a teacher I'm just catching up on these important things. :) So I'm sharing this post about parent communication. I LOVE building those positive relationships with my parents. It makes for a VERY smooth and happy school year for us all. I feel it also, develops that trust between us. So besides email, remind, phone calls, conferences, and notes home, I send a weekly newsletter. Yes weekly! I send it out every Monday morning when I arrive to my classroom. I didn't like sending them out on the Friday before the new week. Why? Well I do believe school is important, BUT I felt like the kids and parents needed to just ENJOY the weekend and NOT worry about the next week until Monday. Now, I'm not saying that it's wrong to send out on Fridays it's just what I prefer. As ALWAYS do what works BEST for YOU. Below you will see an example of an old newsletter that I have sent out to my Firstie parents. It's cute, fun, eye catching and to the point. I don't print 20+ of these suckers out weekly. (Lord knows my printer would be upset with me) I save it as a pdf file and send to parents in a group email. I also save it as a photo and send through remind as well. 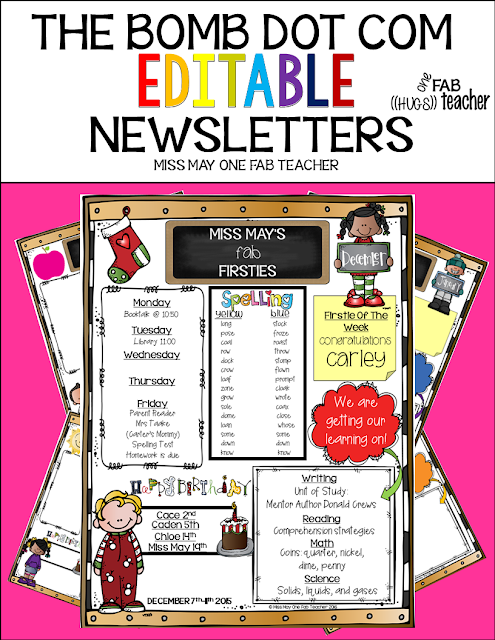 So I created 48 editable newsletters for you! Just make sure you have POWERPOINT to add your text. Have a FAB summer teacher peeps! Teamwork is something I always want my Firstie parents and I to have. CLICK EITHER PHOTO TO SEND YOU TO THIS PRODUCT!